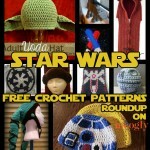 Usually when a crocheter hears the word “frog” they think of pulling out stitches (rippit, rippit! ), and undoing minutes, if not hours of work – not a fun thing! 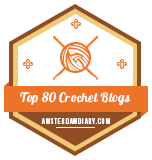 While frogs are usually slimy, (or for yarn-users tragic), today’s roundup features a far friendlier bit of frogging – crochet frog patterns! And they’re all free! 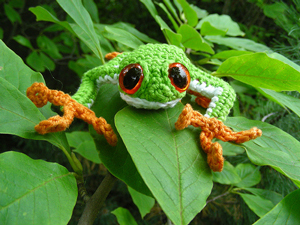 Tree Frog by Brigitte Read, on Roman Sock: It’s hard to pick a favorite, but if I had to I think this one might be it! It’s the perfect blend of realism and cute! 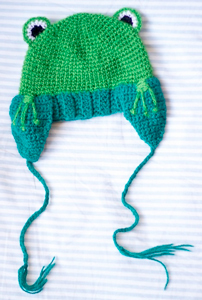 0-3 Month Frog Hat by Corina Gray, on Stitch11: So adorable! Love the eyes on this one! 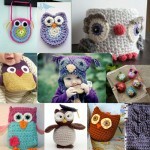 Ovetti amigurumi by airali handmade, a Ravelry download: Offered in both Italian and English, these are too cute – and great for hiding gifts and treats for kids! The frog is amazing – as are the rest of the creatures! 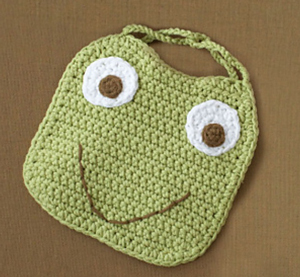 Frog Bib by Lion Brand Yarn: A fun project for a sweet baby – I can see a whole set of these with different features and colors as a gift set! 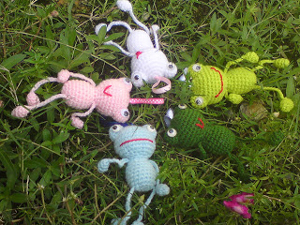 Frog Dissection 101 by Helen Fey, a Ravelry download: This one isn’t cute, but it’s very cool! Educational AND animal friendly! 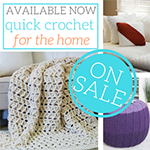 And definitely not your grandma’s crochet! 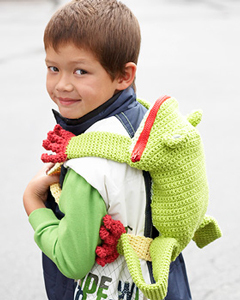 Frog Backpack by Lily / Sugar’n Cream: This one is too fun for little (and big) frog fans! Put that big mouth to work! 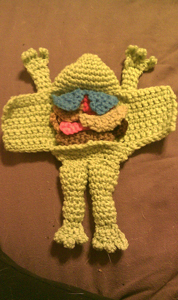 Crochet Frog Hat, on Why Not Make It? 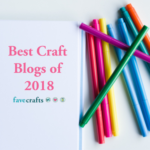 : This one is for 2-3 year olds, and I’m in love with those little feet! It does use UK terms, but the pictures make it look easy! 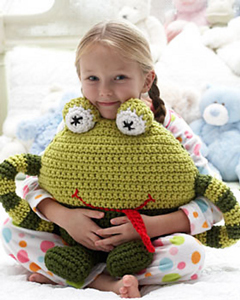 Huggable Frog Pillow by Bernat Design Studio: Pillow animals are a hot gift for kids! 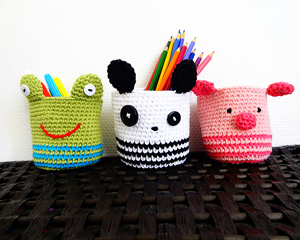 Ami baskets – panda, piggy and frog by Handy Kitty, a Ravelry download: I love all these little guys! So handy too! Happy Frog by Suzielah Rahmad, on mindnsoul: Funny and cartoony, and very popular! 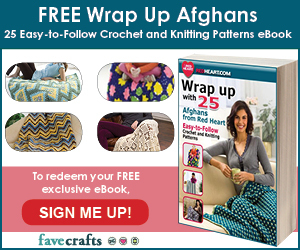 Does one of these patterns have you jumping up to grab some yarn and a hook? 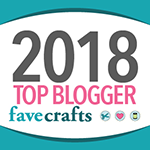 Possibly the most popular crochet frog out right now is Tomato the Frog by Heidi Bears – love those African Flowers! 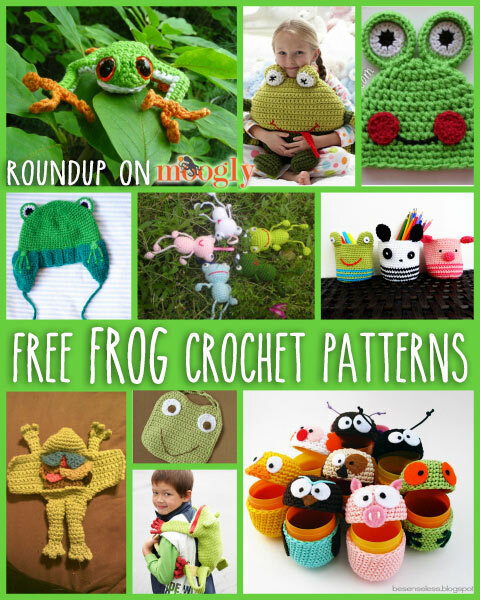 What’s your favorite frog pattern? Share it in the comments! 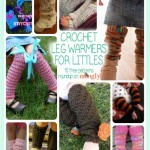 Keep Them Cozy with Crochet Leg Warmers: 10 Free Patterns for Littles! Thanks for all the links! 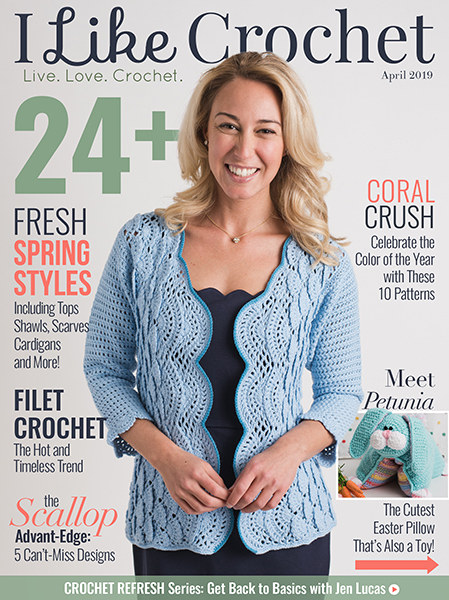 This month is my mother-in-law’s birthday and she is a huge fan of frogs, maybe I’ll crochet for her. Hi Lola! Sorry to hear of your troubles! 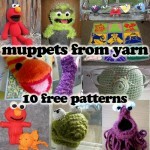 I’m afraid I can’t find any record of a pattern for “Ward the Frog,” I’m sorry! 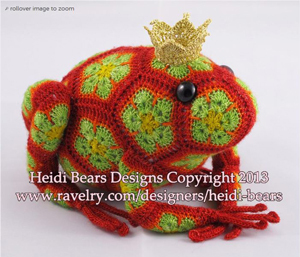 I need a not so cutesy frog applique to go on my waterlily afghan…still searching! Thanks for the dissected frog link, that’s going to a friend in nursing school! Hm, tough one! 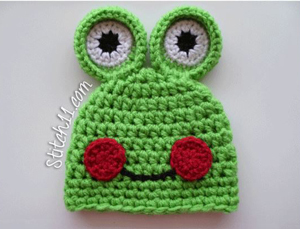 The only frog appliques I’ve seen are definitely cute! I’ll keep my eyes peeled though! Hi Judy! It’s very hard to say, I’d try going to PrintFriendly.com and putting the URL in there.